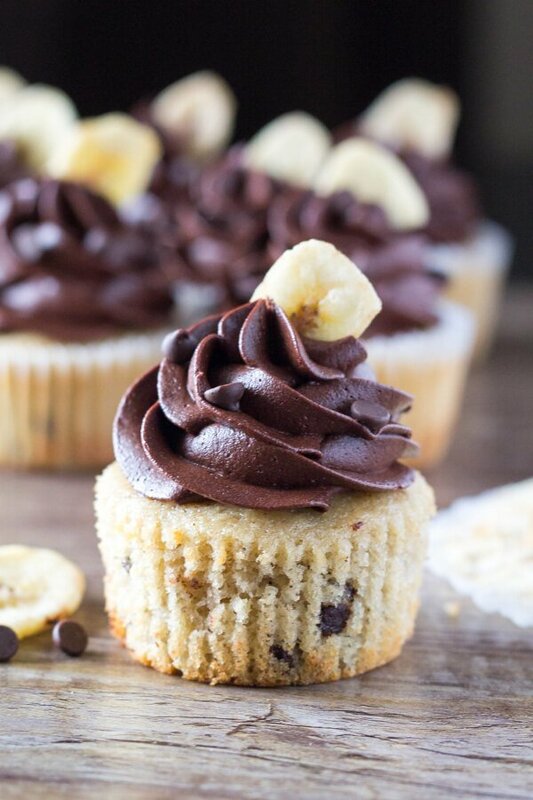 Super flavorful, perfectly moist Banana Chocolate Chip Cupcakes with Chocolate Frosting. If you love banana bread and chocolate – these are for you! 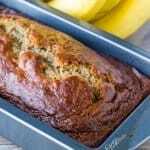 Dry baked goods have no place in my kitchen – which is exactly why I love baking with bananas. Not only do they add flavor, sweetness, and pair deliciously with so many flavors – but they also create the most perfectly moist treats. Like banana bread, banana muffins, or even these delectable banana doughnuts. But sometimes I want delicious banana bread flavor AND I want something that falls in the dessert category. Something I can fill with chocolate and top with frosting. And this my friend – is exactly what we’re making today. 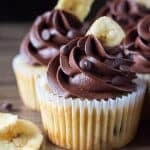 Flavorful, super moist Banana Chocolate Chip Cupcakes with Chocolate Frosting. 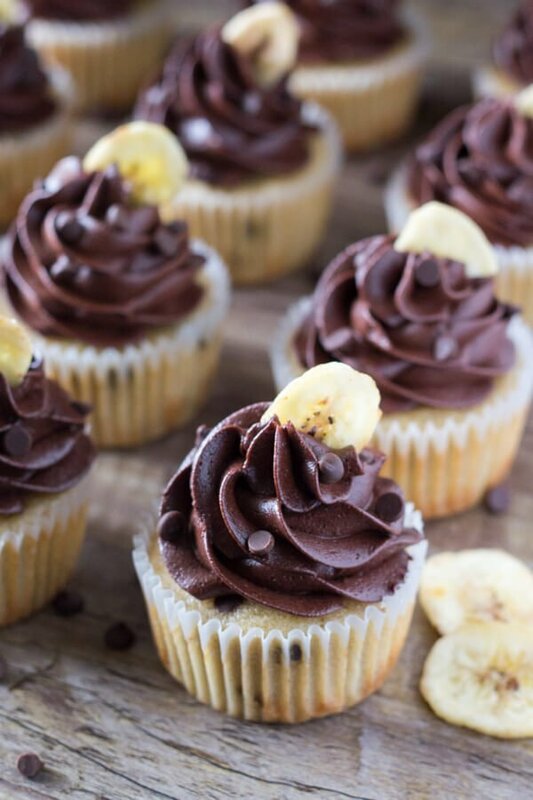 All the flavor of banana bread – but in fluffier, lighter cupcake form and frosted with chocolate buttercream. Seriously – the combo of vanilla, cinnamon & bananas, mini chocolate chips and creamy milk chocolate frosting is perfection. To be honest, I buy a bunch of bananas almost every time I get groceries. And each time I know full well we won’t eat 5 bananas before they turn brown. But I love having an excuse to bake. And these banana chocolate chip cupcakes with chocolate frosting were this week’s byproduct of over shopping. The cupcakes are so flavorful because of the bananas, vanilla, brown sugar & a touch of cinnamon. 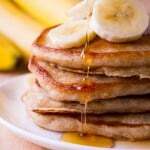 Bananas also help to make them super moist along with using buttermilk. If you don’t have buttermilk on hand you can make a substitution using vinegar and milk. Problem solved. Because bananas create denser baked goods, we need to compensate to make sure our cupcakes aren’t too heavy. First you need to really cream the butter and sugars to create airiness. Then we’re using cake flour because it has a finer crumb and help our cupcakes be light and fluffy. 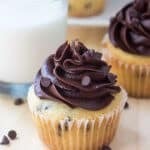 I think these moist banana chocolate chip cupcakes with chocolate frosting are the perfect dessert if you’re looking for something a little different than your classic vanilla or chocolate cupcakes, or if you love banana bread but are craving dessert. You can’t go wrong. 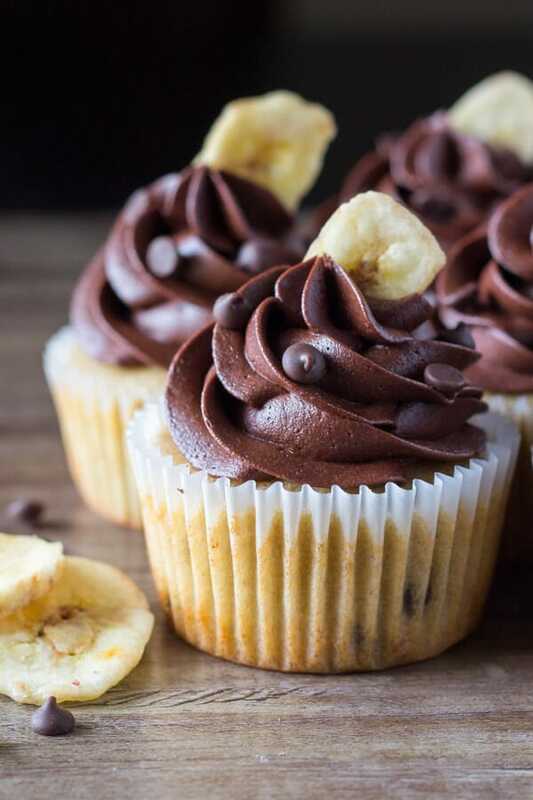 Super flavorful, perfectly moist Banana Chocolate Chip Cupcakes with Chocolate Frosting. If you love banana bread and chocolate - these are for you! Preheat the oven to 350F degrees and line two muffin tins with muffin papers. You'll end up with about 14-16 cupcakes total. In a large bowl whisk together the flour, baking soda, cinnamon and salt. Set aside. In a separate large bowl using a hand held or stand mixer on medium speed, beat together the butter and sugars until fluffy (about 2-3 minutes). Add in the vanilla and eggs and continue beating. Turn off the mixer and stir in the bananas. With the mixer on low speed carefully add in the flour mixture until almost combined, followed by the milk. Once smooth and no lumps remain, turn off the mixer and stir in the chocolate chips using a wooden spoon or rubber spatula. Spoon the cupcake batter into the prepared muffin tins, filling each cavity about 2/3 to 3/4 full. Bake in the preheated oven for 15-18 minutes or until an inserted toothpick comes out clean (apart from any melted chocolate chips). Allow to cool in the muffin tin for 10 minutes before removing and cooling on a wire rack. To make the buttercream, in a large bowl whisk together the cocoa powder and icing sugar. In a separate large bowl using a stand or hand held electric mixer - beat the butter until light and fluffy and no lumps remain. Add in vanilla and salt. With the mixer on medium speed, add in the cocoa and icing sugar about 1/2 cup at a time. Turn the mixer to high and beat in the whipped cream until fluffy. Add in a little extra icing sugar or whipped cream as needed to get the desired consistency. 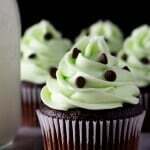 these cupcakes look wonderful! i adore banana and chocolate together, such a genius flavour combination. really wish i had one of these right now! I totally agree – there’s just something about bananana and chocolate that’s completely drool worthy! Oh my, these are just lovely. Banana in dessert is one of my favorite things, and this chocolate frosting looks completely delectable. Making these little beauties now. How much salt should be in the frosting? It is mentioned in the directions but not ingredient list. Also am I understanding correctly that it is 2 1/2 cups – 3 cups confectioners sugar? Not sure I am reading that right. Thanks so much. They are looking lovely and oh so yummy.